At least one species of cherry tree can be grown in any state. As a cultivated and producing fruit tree, sweet cherries do better in warmer climates in hardiness zones 5 through 8, while sour cherries do better in zones 4 through 8. As a flowering tree, there are more than 400 species of cherry, many that are native to temperate zones of the Northern Hemisphere and growing in the wild. The black cherry tree, also known as the rum cherry, grows in the forests of eastern and central North America to the Dakotas. The tree grows to a height of 80 feet. The bark is dark gray and is used to make cough syrup. The wood is hard and used for paneling and fine furniture, according to “The Easy Tree Guide” by Keith Rushforth. The leaves are elongated ovals and alternate on the stem. The white flowers bloom on a raceme, an arrangement in which the flowers are borne on stalks growing from a central axis or stem. The fruit is black, round and edible. 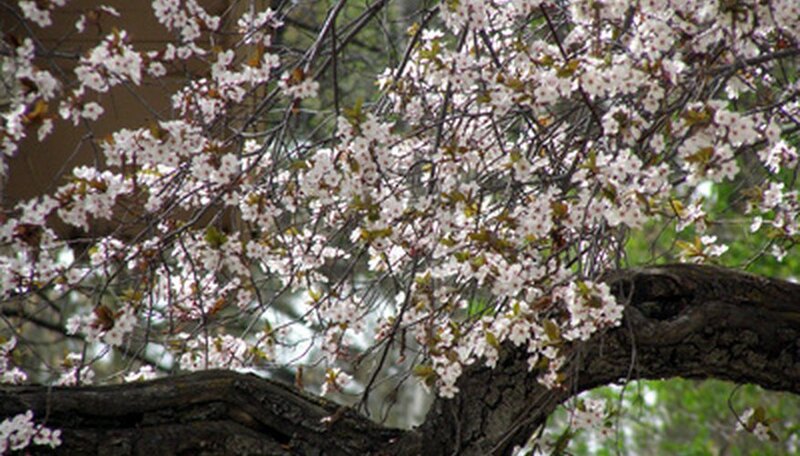 The pin cherry tree is a shrubby tree that reaches a height of 33 feet in the wild. The tree is hardy and able to withstand the cold, according to “Field Guide to Trees of North America” by the National Wildlife Federation. The bark is dark brown and smooth when young, becoming pitted during maturity. The leaves are spear-shaped and taper to a point. The white flowers bloom on short racemes. The fruit is black and grows in clusters. Sargent's cherry is found throughout hardiness zones 4 through 7, according to “The Illustrated Encyclopedia of Trees of the World” by Tony Russell, Catherine Cutler and Martin Walters. The tree grows to a height of 65 feet. The tree is identified by its glossy dark brown-red bark. The leaves are ovals with pointed tips that are dark green in the spring and orange in the fall. The pink flowers bloom singly on stems in the spring. The fruit is black and egg-shaped.